It is possibly inevitable that when somebody mentions skiffle music, thoughts immediately turn to the late Lonnie Donegan. It is easy now to forget that Donegan had many rivals and some of the songs we now associate with the king of skiffle were actually introduced by others. Skiffle- with its image of washboards and bass instruments fashioned from tea chests, is also now sometimes dismissed as a crude forerunner to British rock and roll. In fact, despite its rustic image, a lot of early skiffle was also quite sophisticated and was played by skillful jazz musicians. One of the most competent outfits came together as the Vipers under the leadership of Wally Whyton. This was at about the same time that Lonnie Donegan left the Chris Barber band to start his lifetime of skiffle. The Vipers began playing together as amateurs. Whyton worked in advertising, Martin (guitar) was a coffee bar manager, and Van der Bosch (guitar/ banjo) a wire salesman. Tolhurst (bass) repaired brass instruments for his living and Pilgrim (percussion/ washboard) was a journalist. The "classic" Vipers line-up is probably that listed here, and those are the members featured on the sleeve notes of their first EP shown above. However, there were many changes during the group's short lifetime and it is known that Tommy Steele, along with future Shadows- Bruce Welch and Hank Marvin can be counted among its ranks at least for a short period while the group held a residency at London's '2 "I"s' coffee bar. The Vipers biggest problem became keeping their material from Donegan, and after Lonnie had achieved higher chart placings with the Vipers' first two hits there was no love lost between the two outfits. 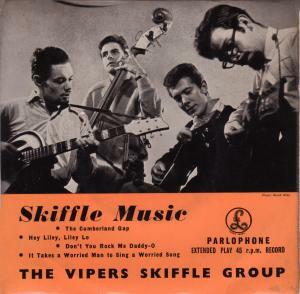 Unlike Lonnie, The Vipers gradually shifted away from skiffle and moved their ground closer to rock and roll- even covering Eddie Cochran material. However, by the end of 1957, the Vipers were already in steep decline while Lonnie Donegan went on to become acknowledged 'king' of the skiffle genre- a fact that frustrated Whyton. However, Wally Whyton went on to have a long and successful career in broadcasting and became a familiar commentator on BBC programmes that dealt with folk and country music.